It was hard, it was rough, but I finally made it! I'm writing this lines seating on the bed, in a room of the ETAP Hotel in Great Colmore Street, Birmingham, UK. Now it is 23:24 (GMT+1 or BST, Brittish Summer Time as they call it here in UK) but let me get back some hours ago, where the journey began. I got up early today (at least early for a Sunday) probably because I was a little bit nervous thinking on all the things I was going to do for the day. After a quick look to check that everything was in place (the luggage, the laptop, all the needed cables, my current-reading book, etc) I tried to print some useful stuff like the confirmation emails from both Virgin Trains and the ETAP Hotel (just in case I would needed them through the day). The first problem of the day appeared then, as the printer didn't work. It seemed like we didn't use the printer for a really looooong time at home, and the ink cartdriges were screwed. "Too bad" - I thought - "I need those papers". The quick solution: I picked up the car and drove to the office just to print them. That worked. A little bit later (after getting home again and park my car on the garage) I joined my girlfriend, her mother and her aunt, for a 30-minute drive to my parent's home. They all got me to the airport in A Coruña. The flight was scheduled for 15:50 (GMT+2) and we arrived a little bit earlier (13:15 (GMT+2)), perfect timing for the checkin of the luggage and to get my boarding card. We then went to a nice place by the beach (in Santa Cristina) to have a drink. 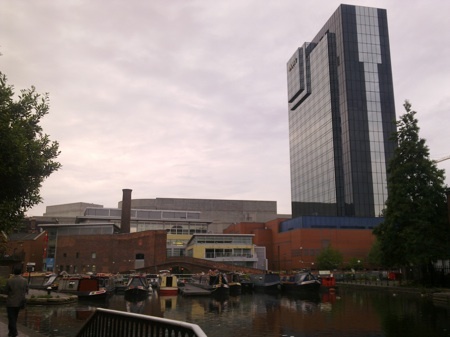 I was a little bit nervous, not for the flight neither for the travel itself, but for the idea of getting a flight to London, then a 1-hour trip by tube to the London Euston Railway station and then a 2-hour trip by train to Birmingham. As always, I got the tickets only the needed time to get from one point to another, meaning that I was going to arrive at London Heathrow at 16:50 (GMT+1), with the Train leaving Euston at 18:58 (GMT+1). The tube trip is about 1:10 hours (time enough to do it, but not enough to avoid me getting nervous before taking the flight). After a great time drinking some beers and talking we went back to the airport (just in time, the scheduled boarding time was 15:20 (GMT+2) and it was 15:10 (GMT+2) at that time). I went to the security checks and then I realized I do have superpowers. This time, the superpower of premonition. Yep, some of you already know that my flight to London was delayed. A delay of 1 hour that was going to make me miss the train to bham. Seems some problem in Barcelona's El Prat airport was causing the plane to arrive later than expected. 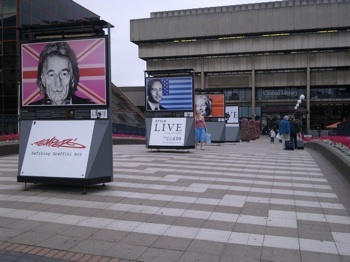 Anyway, as the Monty Python said - "Loooook at the briiiight siiideee of live...". So I tried to cheer me up thinking about the adventure behind the rest of the trip, and about how many more surprises should appear. The flight was really nice. There was almost no clouds, and I was able to see everything clearly, from the coast of galicia from the coast to UK and some islands. I spent half the travel reading Mona Lisa Overdrive. The other half trying to to listen to all kinds of funny conversations. There are all kinds of people in that plane, from young students that were going to spend some days in London, in order to learn or improve their english skills to some adults that were going to visit old friends. 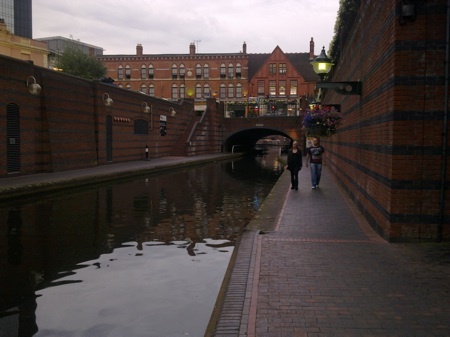 I met there a group of nice teachers that were going together to Manchester for an English-speaking-improve course. We arrived at Heathrow at 18:05 (GMT+1) and I went through all the pick-some-money-and-the-luggage process. Yes, I was going to miss that train. Some minutes (and a fast walk) later I reached the underground station, where I got a 1-6 zone ticket for the tube. There I met a nice girl from Negreira. She was studying medicine in Santiago de compostela and she was going to be in London for 20 days to improve her english skills (seems a lot of people do that in summer). We went together for the most of the travel by tube until I reached Green Park station, where I switched from Picadilly Line to Victoria Line. Then the good luck came back to me. I arrived at the London Euston Rail Station at 19:50 (GMT+1) and I went to the helpdesk of Virgin Trains just to explain them my problem with the delay. "Good news" - They told me - "You've an off-peak return fare, just get your ticket from one of the ticket machines and step onto the next train". Goooood!!. I went to one of the machines and got my tickets and then, second lucky strike!, it was 19:56 (GMT+1) or so and the next train to birmingham was going to leave at 19:58!!!. Man, you should see me running through the station, trying to find the bloody platform 4... ;) I almost got into the wrong train (that would carry me to Liverpool). Once I was in the right train I felt myself relaxed and I just stayed on my seat to enjoy the travel by train through the midlands. I got a comfortable seat by the window, with a table and a power socket (jay!) The train even has 2 different wifi access points you can use, as cheap as 4,60 pounds for 1 hour. 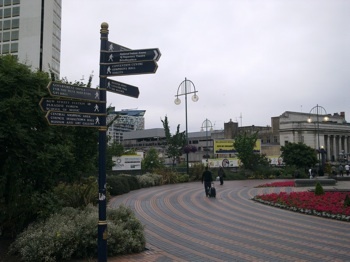 The train arrived at Birmingham New Street Station earlier than I expected and it was nice to recognize the city once I left the station, even if I only had been here once before. Reaching the hotel was quite easy, thanks to the Nokia Maps app in the E72. I only had to set the current location and then set the route (by walk) to the hotel and it took me less than 15 minutes to arrive. And now we are back at the begining. Here I'm, writing these lines before trying to sleep a little bit. Tomorrow will be the first conference day of the Europython 2010, and it will be a loooong day. Stay tuned for more posts about this amazing UK week! I would like to write some lines about a small (but really useful) script Antonio Cuni showed me yesterday. It is not a script he had written by himself, and probably you could find it in the Internet (UPDATE: In fact it is called TinyHTTPProxy ;D). While having some beers at the Walkabout last night, we tried to connect to the Internet using my laptop and the Walkabout free wifi, but (after many tries) we found out that it didn't play well with the https protocol. Each time a website (like twitter or gmail) was redirecting us to a secure https connection the connection just got stucked. It mostly works (the Walkabout wifi was a little bit troublesome anyway). From time to time there were timeouts and it was not so usable. The solution Antonio provided was, indeed, by far more elegant. He showed me this python script which is a fully-functional http proxy in only 123 lines of code!. Amazing, isn't it? Then you only have to modify your browser to use a proxy connection with http/https/etc requests using the hostname/ipaddress of that box as the proxy address. We tried that and it worked just perfectly fine, but with the limitations of the flaky wifi inside the pub. Then you do not need to modify your /etc/hosts file, you don't need to open port 8000 at home and you do send all the http requests through the ssh tunnel, which in the end is an already established connection (it shouldn't close) while http requests from the browser are going to be multiple requests sent through the wifi link. Imho, this would be an almost-perfect approach, but I'll try tonight and check if there is any difference. After going to bed a little bit late yesterday I woke up at 07:45. I had a shower and I left the ETAP at 08:15, just to join Antonio Cuni on my way to the conference. The Keynote today was really a good one. 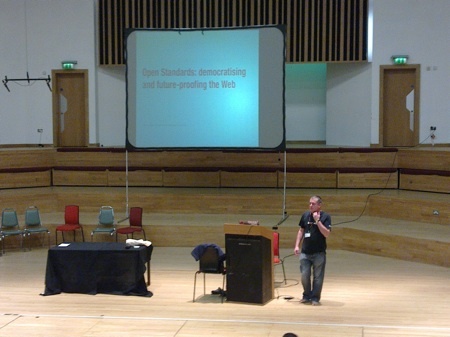 Bruce Lawson (from Opera) talked about web standards, accesibility and HTML5. He showed us some incredible examples of the <canvas> and <video> new tags, as well as some real stories about how important web standars and accesibility are. Bruce is quite a good speaker, and that's nice to find in someone giving a Keynote. 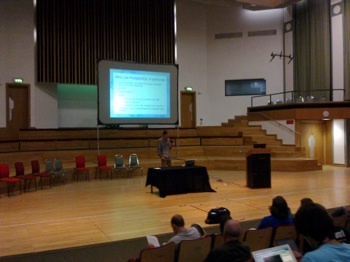 After the Keynote I went to the New Lecture Theatre to attend the Appstats talk from Guido Van Rossum. 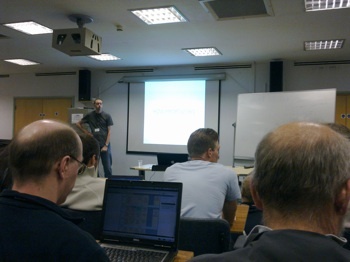 This was the second time I attended a talk from Guido about something related to AppEngine. This one was oriented to people with a background on AppEngine, as Appstats is an application that allows you to gather some statistics about how your app is performing within the AppEngine infraestructure. Guido showed us some off-line real examples (off-line because the wifi wasn't working at that moment). 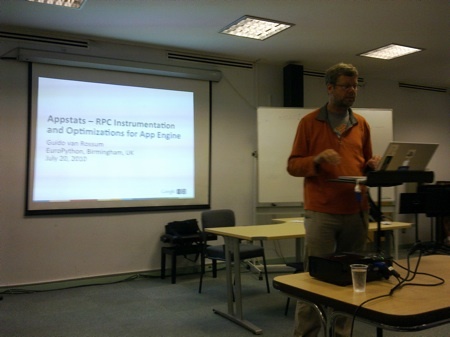 For me, the talk not only covered Appstats but some internal information about how AppEngine works (using RPC calls, the kinds of backends you can use, etc). So it was quite interesting and it reminds be that I should get some free time to play with AppEngine itself. Next was this talk from Bart Demeulenaere but, more than a talk, it was a little introduction on his idea on creating a framework that improves python performance and HPC support. 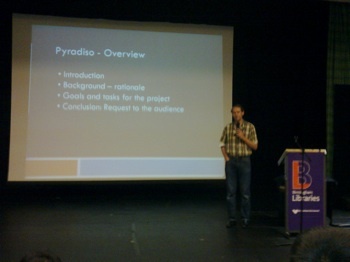 Then he asked the audience for ideas, searching for people willing to join him on this about-to-be-born project. I found this one not so interesting. The speaker had a strong background with Java and C++, but he missed a lot of related projects before setting up a talk like this (imho). This one was a surprise for me, as I was expecting the talk Real time web with eventlet by Ben Ford but it was a last-minute change and Raymond Hettinger had the chance for a second session of the Idiomatic Python talk from yesterday. Then he showed us some tricks/hacks to simplify certain tasks. Today's menu was sausage (really big one, chopped into small pieces) + vegetables and spicy (again) sauce. The dessert was a piece of chocolate cake. I've to say that, imho, the food is being quite better than last year. After lunch I didn't attend any talk for a while (two talks in the end) because there were no talks really interesting, so I just kept myself seated somewhere where the wifi worked almost fine, working on some stuff. It was pleasant, as I could share some thoughts with other people, talk with even more people on the #europython IRC channel on Freenode and, definitely, have more fun. 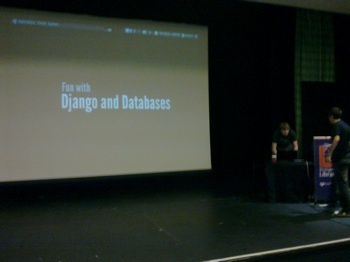 The first of the two last talks of the day was Fun with databases and django, with Andrew Godwin (the maintainer of south). Amazing talk, even if we had some problems understanding Andrew (he really, really talks too fast for any human being!). He covered all the posibilities you've to store data when working on a django-based proyect, from SQL databases to messaging queues, going through document databases or key-value databases. He recommended strongly MongoDB and Redis as the best options right now when talking about document databases and key-value databases (respectively) to work with in Python, but he strongly encouraged us to do some tests on our own and see all the available options, because each one could be the best one for a certain environment and only through testing you would find out which db is better for your project. 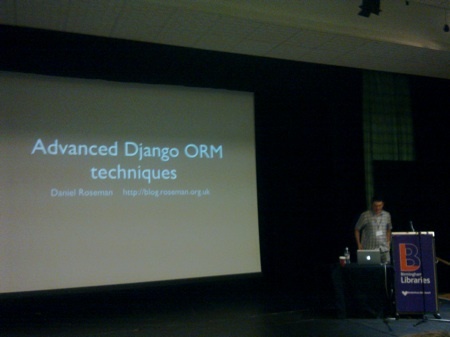 Daniel Roseman showed us with this talk some really god hacks to optimize our django ORM use. For me, it was probably one of the best talks so far. I understand almost every word from Daniel (I've a lot of work with django) and I found that some of the problems he explained through the talk were problems I found myself at some point of some of my works. Very interesting indeed the way he was able to reduce the number of SQL queries executed against the database backend with some of those tricks. I think it would be nice to meet him and show him some code of one or two of my latest projects. 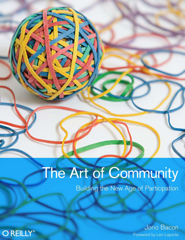 Social, or how to have more fun! 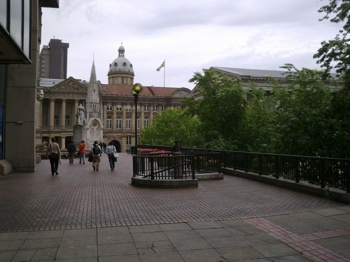 This is what I've found to be very common in birmingham, you can find a lot of those really nice old-style british houses (with the clocks and things like that) and, just by them you can find really huge buildings, modern-style. I've been there last year, having a drink (or two) with Santi. It is a really nice place by the canals, so I wanted to go back and see how it was one year later. It was a looong walk so I took some pictures of it. This is one of my favourites. 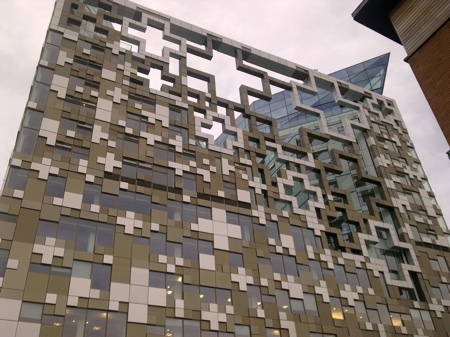 If you ever come to birmingham and you see that building on the picture, you will be astonished for a while. It is some kind of a puzzle, and it is empty on the upper middle side of it, you can watch the sky through it! I had dinner at nandos and then a walked to the Walkabout, where I met some really nice guys from Slovenia, Belgium and Germany. We enjoyed the live music in the Walkabout for quite some time (We've been lucky that this year's europyhon is on the same week as the Annual Jazz Festival). Then we met some other people in the Wellington and we had a great time just drinking beers, talking about a variety of topics... I had a great time, in fact, I've been with them until some minutes ago, when I decided to come back to the hotel to write this post and go to bed (tomorrow is conference day 3!). So, this was the second europython 2010 day, really nice, both inside and outside the conference! 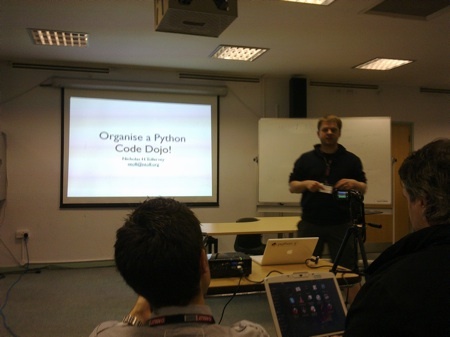 Talk: Organise a Python code dojo! 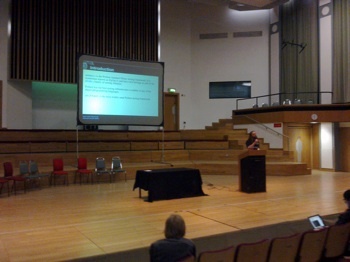 As soon as the keynote ended, people began to come in the room and the talk began. 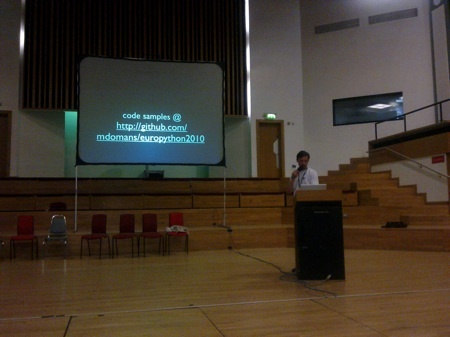 Nicholas Tollervey explained what is a coding dojo and shared his experience organising the London python coding dojo. I found the idea of the coding dojo quite interesting, even more if I think that is very similar to what we've been doing in Lugo for quite some time now, only with the differences that we call them bunkers (instead of dojos) and that coding dojos have a predefined set of rules. Nicholas is a really good speaker and he surprised us all when we went to the piano that was in the talk room (hey, this is a conservatoire!) and he played the piano, using it as a metaphore to explain something from the talk. It was quite amazing and a lot of people wrote tweets about it :). Next was the turn of Esteve Fernandez. I was not really interested in the topic (never used twisted before, even if I knew about it) but I would like to attend this talk because I know Esteve (from last year's conference) and there was no other priority talk in the schedule. 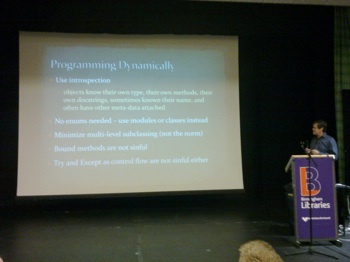 As I've said, I'm neither a twisted developer nor a twisted user, so I don't know if the talk was really interesting. Estebe covered how you could adapt your libraries to be twisted-compatible (because seems twisted is a little bit difficult to work with) and he showed us some examples of his work adapting different kinds of libraries. It took me some time to decide myself, but once I was in front of the table, I knew I was going to do it!. This talk would be in the third topic, as it was a comparison between HotPy, PyPy and Unladen Swallow, three of the current projects (with Jython and IronPython) that are trying to develop a replacement for the current cPython implementation. measuring time, not speed. 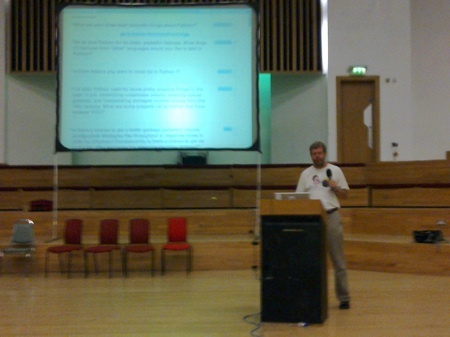 Mark Shannon went through a list of features explaining the implementation of them in the three projects. 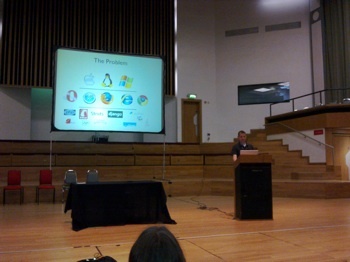 When the talk was finished, I had the sensation that HotPy and PyPy are more mature projects than Unladen Swallow. And today it was fresh salad with roasted chicken and two potatoes (and a blueberry muffin as the dessert). I had lunch with Ian Ozsvald and we have been talking about his lighting talk about the face-tracking robot, which was quite impressive. I told him that I had read the article Building a face-tracking robot (Headroid1) with Python in an afternoon in The Artificial Intelligence Cookbook last week so, for me, it was very nice to meet him (a pleasure, may I say). 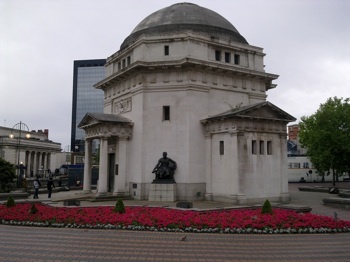 We had lunch outside the conservatoire, just sitting on the square between the Birmingham Conservatoire and the Birmingham Museum and Art Gallery. We met more people there and we talked about the talks we've been attended. 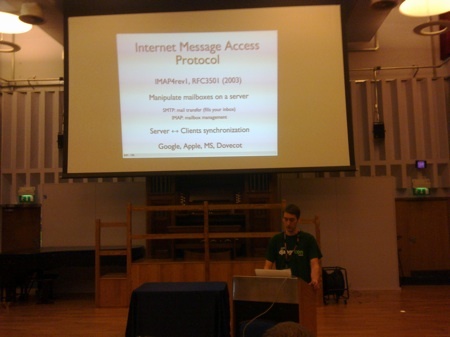 After lunch I went to the Recital Hall, where Bruno Renié covered the available libraries in Python to connect to IMAP servers and interact with them. At the beginning of the talk he told us that he was currently working on a (django-based) web client to connect to IMAP servers so, as soon as the talk was finished, I went to him just to talk a little bit about his project and to tell him I've a similar project which is currently pretty advanced. During the talk he showed on-screen IMAP sessions using telnet through an SSL connection (to show us all the posible IMAP commands you can execute on a server, and the results of executing those commands) and then he went through imaplib ImapClient and a new library that has support for the new OAuth method gmail is using to authenticate users. The talk was good, but I think it will be even better the posibility to collaborate with Bruno on a django-based webmail project. Another talk I was not really interested in, but I wouldn't miss. 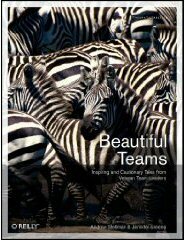 One recommendation: If you ever go to any kind of Python conference and in that conference there is a talk from Martijn Faassen, seriously, do not miss it, whatever it happens, don't miss that talk. Martijn is one of the best speakers I've seen. He is funny, the talks are always interesting (even if you are not closely-related to the topic) and you will learn something new. 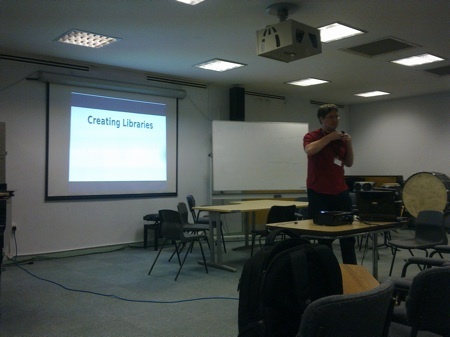 In this talk he told us why you should create libraries instead of apps or packages (because more people will be able to use them later, for example) and he showed us some examples of developments he had made in the past. As Martijn had to answer a lot of questions after the previous talk, I arrived a little bit late at this one. 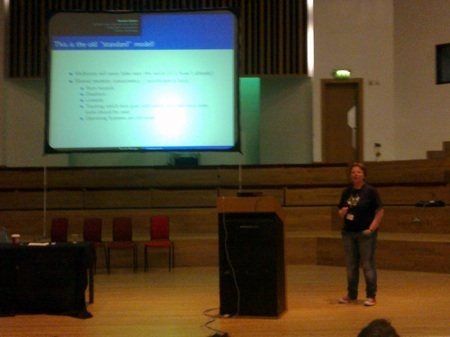 Sarah Mount introduced us to python-csp, a new library that helps with high-level concurrency and parallelism. I've to say that I wasn't paying so much attention (sorry Sarah) because I was writting some stuff for my lighting talk (Yes! ;D). I kept myself working on the presentation for the Zero14 lighting talk during the coffee break after Sarah's talk. I was so excited that I couldn't stop. 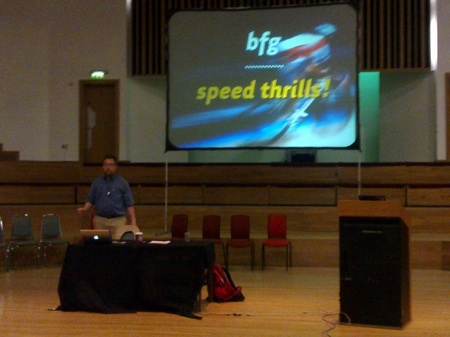 The presentation will cover the core ideas behind BFG and at the end of it you might want to give it a try. I've to say that Charlie Clark started the talk advicing us he wasn't going to give a technical talk at all, but it turned out to be mostly a promotional talk. He said that BFG was reliable, fast, scalable, etc, but he didn't explain why. He highlighted the good documentation BFG has, the BFG book, and the fact that Chris McDonough is behind this project but (IMHO) it should be far more interesting if he had showed us some examples of BFG code, or some real information why BFG is fast, scalable, etc. After the talk I was a little bit dissapointed. 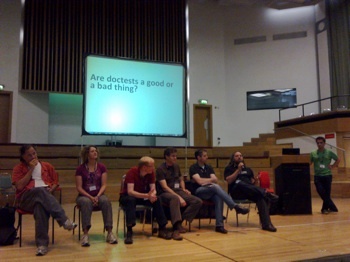 I've read about BFG, I've see the good docs the project have and I think it deserved a better talk. 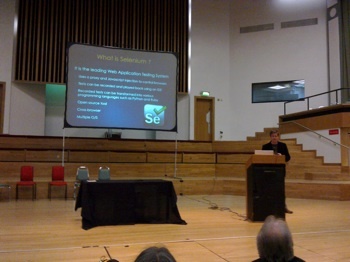 The last talk of the day. All the things I expected from the BFG talk were in this talk about Grok, another web framework coming out of the Zope community. 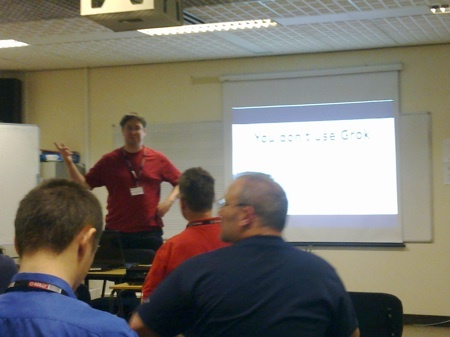 Again, Martijn Faassen delighted us all with a great talk covering the history of Grok itself, when it was born, how it was born, and then moving onto some real explanations on the benefits/drawbacks of using Grok. I really enjoyed that one. After dinner I had two more beers before leaving to the hotel. Tomorrow will be the last day of europython 2010, and I don't want to miss anything! The last day of europython 2010 began early for me. I got to bed earlier yesterday so I didn't have too much problem to wake up today. 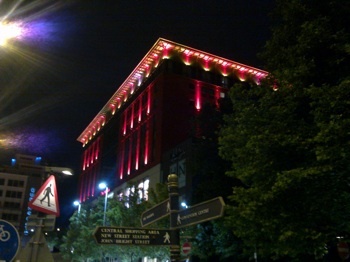 I finished some work on the presentation of my lighting talk and then I left the hotel. The last day of any europython conference is different, there are less talks (because there is some reserved time for the lighting talks) and there is some time in the end of the conference for announcements, thanks and a raffle. This europython's ending Keynote was courtesy of Guido Van Rossum. It was a Q&A session and Guido answered a lot of questions both from the online q&a moderator from google (where we were able to write questions since the beginning of the europython and even vote for the best ones) and from the audience. First talk of the day. 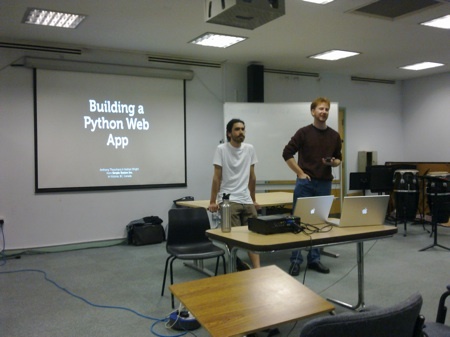 This one was very interesting for me, as it covered the experience the people from MediaCore on building a big webapp from scratch using python. It was quite interesting to see their point of view and they even provided some in-detail comparisons between django, turbogears and pylons (the three main web frameworks they've tried during the development), between the django template system and genshi (two different templates systems) and between the django ORM and sqlalchemy. I found the comparisons quite interesting, even If I don't agree on certain critics to both the django ORM and template system. It seems that they don't like them, but their points on the supposedly weaknesses didn't appear valid to me. For example, they were complaining about advanced if comparisons in the django template system, while in genshi seems to be easier (it is much like the ZPT using a xml-like syntax). Which they didn't say is that it is quite trivial to write a template filter that performs exactly the comparisons/checks you would need, removing that way all logic from your templates. The same happened with the examples on the django ORM vs sqlalchemy comparison. Anyway, it was a good talk, thnx guys. 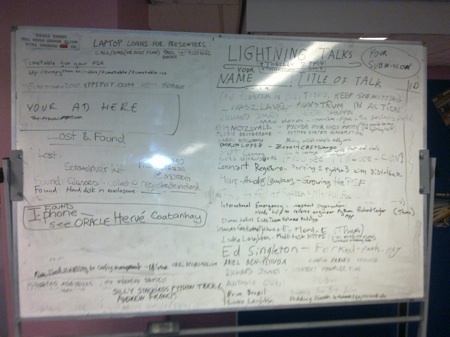 Lighting talks timetable, mine included! 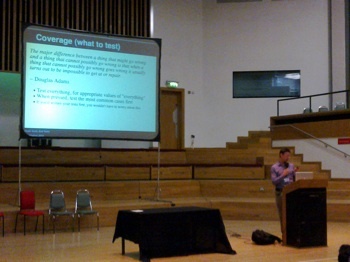 During this talk, Michael Domanski showed us some tips and tricks useful when working with caching in Python code. Quite impressive the example where he first used dicts to manage the cache (as a simple example) and then he moved on to memcache, doing only a small set of modifications on the previous code, keeping all the logic intact. The worst part of this talk is that he had some good example pieces of source code embedded in his presentation (using apple's Keynote software), but the font size was too small to be read in a big proyector screen. I told him to use the control+trackpad trick and zoom the screen, but seems Keynote doesn't support it, too bad. As usual, the lighting talks were great. 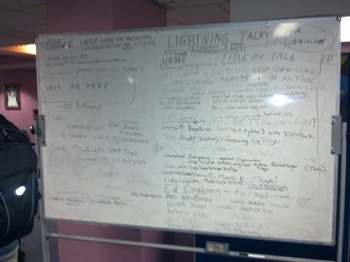 Some of them were funny, some other more serious and interesting, some other mere requests for help on a certain projects. All of them quite good. This year I didn't take any pictures of the lighting talks, as I was waiting for my turn to be up there, talking during 5 minutes, and I was really nervous and excited. After last year problems with the proyector, they set up a testing zone, where everyone had to try their laptops before getting into the real one. Anyway, it didn't work, and everyone not having a macbook had problems with the connection. Mine was one of the last talks. When I heard my name, asking me to go down and seat on the queue, I thought my heart was going to explode because it was beating fast as hell, but as soon as I was there, in front of all the atendees, with the mike in my hand, I just knew what to do, what to say. When I finished, first thing that came to mind was that I would have been able to give a 45 talk without too much trouble. 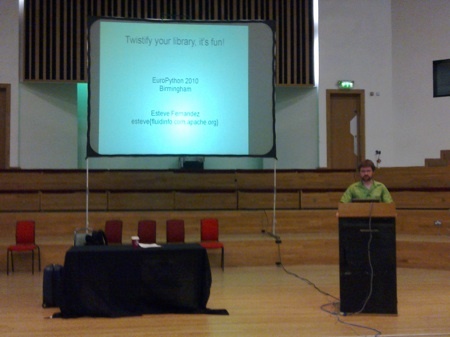 Perhaps in europython 2011? When the time of the lighting talks was over, it was time for announcements (europython 2011 will be in florence, italy, there is djangocon 2010 that will take place in Portland on september and the plone conference in Bristol in a few months), thanks (all the volunteers, the sponsors, the speakers, the atendees, and specially for John Pinner) and the raffle!. There was the usual raffle for all of us who fill the satisfaction form. What could I say, when John Pinner himself said my name, the sensation was almost the same that the one I felt when going to give the lighting talk. I couldn't believe it was me! After everything was over, I met some people for going out one last time, have some food and some beers and just talk about the past few days. I've met some amazing people during this europython. I've shared with them ideas, beers, talks, and I think that I've made some new friends I'm going to meet again next year in Florence. Thank you guys (you already know who you are) and thanks to anyone involved in making the europython 2010 posible. 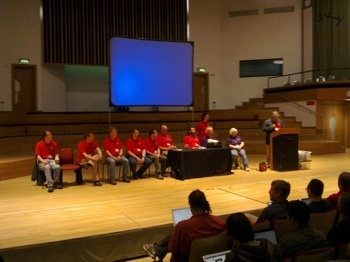 This has been a conference noone will ever forget. I've just finished to post everything in my blog some minutes ago. I've added the last 2 posts with the date/time when I wrote them, instead of the date/time when I published them. I really wrote the posts offline every night, but I had to wait to post them because the lack of internet access in my ETAP room and the fact that the wifi connection in the conference didn't work most of the time. The first two days I went down to the hotel lobby, but even that wifi connection didn't work most of the time, so I decided to wait until being back home to publish the posts. I didn't have a lot to write about Friday, I just spent the day traveling from Birmingham to Lugo, and I'm not going to bother you with it. I arrived home later than expected (once again there were some problems with the flight from London to A Coruña) and I was tired enough to crash on my bed and sleep like a baby on saturday. Today I took my time for going back through the week, learn some lessons and put everything in place. 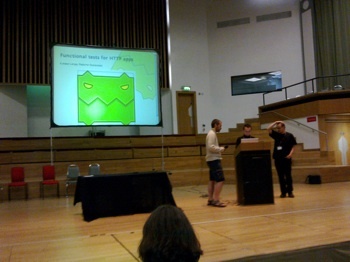 I really enjoyed europython 2009, and europython 2010 was even better. 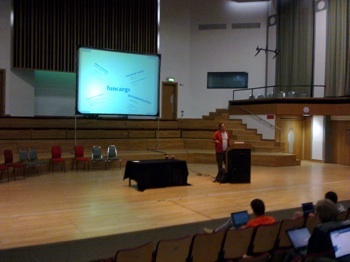 I can't wait to see what will be europython 2011!